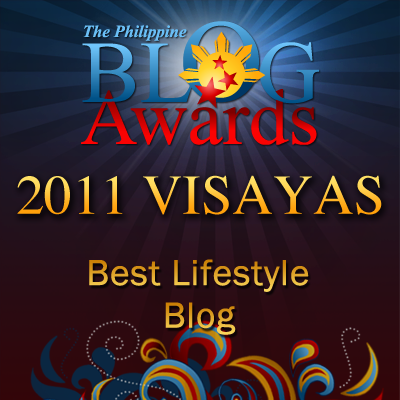 Random Thoughts of Gil Camporazo: Bacolod MassKara Festival 2011: What's New? Bacolod MassKara Festival 2011: What's New? The Bacolod MassKara Festival 2011 has come up with a new logo which is a mixed mass or conglomeration of spectrum of colors, the mask, the hair of the mask, the headdress of the mask, and the public plaza bandstand. The logo was designed and illustrated by Daryl Feril, a student of La Consolacion College-Bacolod with the direction of veteran Bacolod visual artist and fine arts professor Bamboo Tonogbanua. Tonogbanua described the significance of every object in the design. Thus, the spectrum of colors represents the festival is famous for. The combination of the glamorous but realistic portrayal of the mask and the vibrant colors of the MassKara festival are the symbols of the festival itself. The hair of the mask, which is like flowing ribbons symbolizes the lively and festive atmosphere of the festival. The headdress shows the symbols of the new icons of Bacolod like Bacolod City Government Center, the Blessed John Paul II Tower, and among other rising business structures. And the public plaza is where the MassKara street-dancing competitions are held, and the Philippine flag, the symbol of patriotism. MassKara is a celebration and expression of thanks for the abundance of blessings life brings for Bacoleños. It is held every October and culminated on the the weekend nearest October 19, which is the Charter anniversary of Bacolod. In yesterday's launching of 2011 Masskara Festival website and the unveiling of its logo, Festival director Eli Francis Tajanlangit presented its official theme of the festival, "Celebrating the New Icons of Bacolod", which highlights those new places and structures that sprouted in Bacolod City in recent years signifying Bacolod's progress and development. "This year’s MassKara Festival will focus on these new icons—landmarks, structures, institutions, and even personalities—that have dramatically transformed Bacolod in recent years," he said. The official website of the 2011 MassKara festival is www.themasskarafestival.com. For its update, visit its site. The meaning of every symbol in the logo is definitely clear. However, I notice that the mask resembles a woman. Why man is not represented? The festival is for everyone. Isn't it? Etymologically speaking, "mass" is many or multitude and "kara" is face. So, "MassKara" is the face of the many. Why only woman's mask is illustrated? The Masskara 2011 Logo was not solely designed by Mr. Bamboo Tonogbanua. It was collaboration between Tonogbanua and Daryl Feril, a student from La Consolacion College-Bacolod (http://www.facebook.com/darylferil) who illustrated the logo from sketch to final. nice work Daryl Feril! and Bamboo Tonogbanua. the aura of the new logo is refreshing! i wonder.. its only through your blog that i new thats its actually Daryl Feril who did the"dirty work" of creating the logo. but why all the credit is now going to Bamboo tonogbanua? the newspapers and press releases never mentioned the name of daryl Feril. infact they always mention that its Bamboo who made the logo. I followed up anonymous' comment and link, and found out from Daryl's FB the factual info, that it's Daryl Feril who crafted the logo and Mr. Tonogbanua just directed it.